Do you enjoy singing? Volunteer singers are welcome in the Epiphany Choir. This adult choir is a very dedicated and loyal group, in part because rehearsal is grounded not only in solid musical practice, but also in historical, spiritual and liturgical awareness. 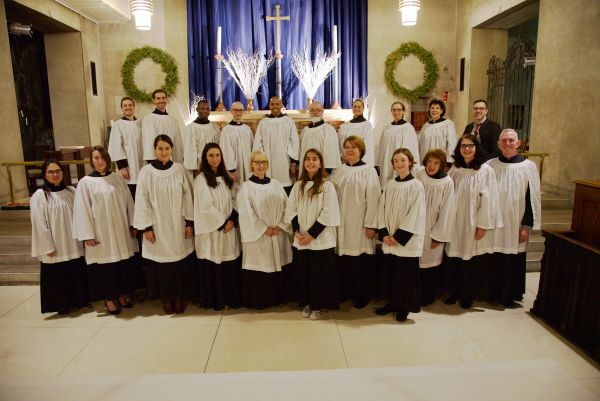 Led by a director with a broad background that includes seminary study and advanced degrees in performance and literature, the Epiphany Choir is a great place for you to expand your music skills and increase your understanding of the role of music in the liturgy. Weekly rehearsals are held Thursdays at 6:45-8:15pm from early September into June. Sunday warm-up rehearsal is at 9:30am before the 10:30am service. The last Sunday of the 2018-2019 season is June 2, 2019. The repertoire is diverse in style and level of difficulty, including Gregorian chant, Renaissance polyphony, J. S. Bach, Gospel music and spirituals, and music by living composers, with a particular emphasis on music in the Episcopal (Anglican) tradition.